Sports and music fans everywhere listen up. Forget about watching your favorite team play at the sports bar or catching a concert at the typical arenas you’re accustomed to because these 10 stadiums create a one-of-a-kind experience with their intricate designs. From a mountainside to a crystal ball, their wonderful facades are known to drive drooling fans by the packs. So take a trip and have a seat in their amazing structures, which promises to be an architectural, show-stopping adventure. Some refer to the stadium as Beijing’s National Stadium while others simply call it the “Bird’s Nest,” but its metallic exterior guarantees to be an eye-popper. 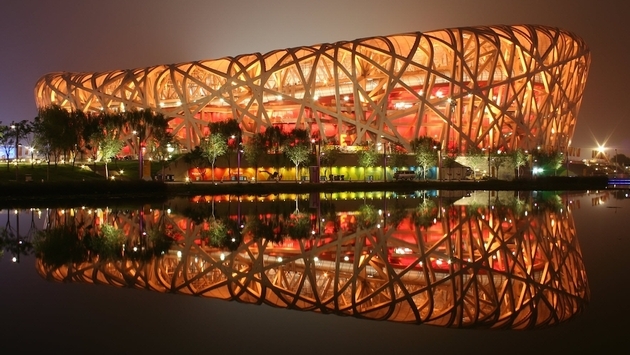 The home of the 2008 Beijing Olympic Games is an impressive work of art that boasts huge steel frames entangled in one another that gives the impression an unworldly bird created this for its flock of babies. However, measured at 99.614 square miles about 90,000 spectators can comfortably watch the sport events taking place here and listen to the acoustics vibrating off its steel frame clearly. As one of the city’s jewels, which intends to depict China’s rise as a nation through its bold and intricate layout, you’ll be in for a dynamic experience. And once inside you may even feel as comforted as a baby bird does in this nest, but there’s only one way to tell. From afar this dragon appears to be in a deep sleep. But once you’re within earshot of the exciting cheers ringing out of Taiwan’s largest stadium, you’ll see how it vivaciously comes to life. The National Stadium is masterpiece that honors the mythical creature with a curvy shape. Since it made its grand debut in 2009, it has become a trailblazer in its own right by becoming the first stadium completely powered by the sun. The National Stadium also has the capacity to seat about 50,000 people comfortably, which made the arena a premier spot during the 2009 World Games. As a constant host to football matches, catching an exhilarating game in a dragon will be a unique experience you might have to see to believe. Not many stadiums appear to be wearing earmuffs like the CenturyLink Field, but when the screams of fans have been known to break the Guinness World Record for loudest crowd roar then the fashion accessory is a must. At least that’s the look the stadium gives off with only the field completely exposed. Home to the Seattle Seahawks, the CenturyLink Field officially opened in 2002 and has remained a centerpiece for the city ever since. Along with NFL games, the arena also serves as a venue for concerts, soccer matches as well as tradeshows. With the ability to accommodate around 67,000 screaming spectators, it is quite easy to see why the CenturyLink Field is a fan favorite. No architectural feat is too big for oil-rich Abu Dhabi, so why not carve a sunken stadium into the side of a mountain? At the Rock Stadium is destined to coddle fans’ emotions by its hillside location alone with a design infused by the ancient Greeks, but that is if you can find it. This is because the stadium is expected to camouflage with its desert surroundings, and with an underground location to block out the sun’s heat you may have to do a bit of trekking on the Jabel Hafeet until you hear the sounds of pure pandemonium. Nevertheless, the climb might just be worth it, especially if you’re thrilled about witnessing a show in a rock. While we’re in Abu Dhabi we’ll take a trip to another jaw-dropping stadium. Like many racetracks around the world, the Yas Marina Circuit keeps fans on their feet as high-powered vehicles zoom past them at great speeds. However, the adrenaline doesn’t begin to rise at the track but from the moment visitors are in view of its drastic appearance. In fact, it looks like spaceships should be parked here by the futuristic approach with over 20 twists and bends etched into sand dunes. Its sleek and innovative style is host to many action-packed adventures including taking the racecars for a spin or indulging your love for a good race with a kart lesson. And if you happen to be visiting the Yas Marina Circuit at night, its eyeful of rainbow colors as they dazzlingly light up the pitch-black sky gurantees to be an irresistable sight. Set against the beautiful backdrop of Dublin, the Aviva Stadium is unlike any of its kind. For one, it is doesn’t look like the typical sports stadium we are accustomed to since it appears like a huge glass bowl, which makes venturing inside the ultimate adventure. And once you’re seated in any of its 67,000 seats at a rugby or soccer match or concert, you’ll see firsthand why it is the ultimate game-watching hotspot. Boasting an architectural design that rivals some of the best buildings in the world, the arena is also the proud recipient of many awards including the Green Building Award in 2011 and Best Building Award in 2010. When you can actually sit in a huge bowl, there’s no reason to enjoy a game on a plain old TV. We’ve proven that all stadiums take on different shapes and sizes, but some like to be dipped in paint too. That’s what can be said about PGE Arena Gdansk, which stands out with a vibrant gold color. Even if you’re unsure about its presence, there’s no way to tell it’s a host to some of Poland’s biggest events like world-class concerts and football because of its circular shape, which conceals much of the stadium’s interior- unless you just so happen to hear the vibrant roar of the crowd. Nevertheless, the stadium fashionably represents the gemstone amber which was dug up from the Baltic Coast. And telling by its unique color, even haters of yellow are compelled to watch a game or two here. Once again, there’s no room for lame designs, especially at Camp Nou which is as colorful as the city of Barcelona. Shades of red, blue, yellow and green dominate the dome’s numerous seats, but there is more to Camp Nou than its tie-dyed interior. It is home to a museum of trophies that have been rightfully earned by the stadium and the Player’s Tunnel is artfully decorated with portraits of athletes. However, from the outside alone people are drawn to Camp Nou that also sits like a bowl in the heart of Barcelona. At night it is a grand spectacle for the eyes because it is so colorfully lit it’s seen from miles away. Camp Nou is one of the most dazzling locations to watch a team score, and as the roar of the crowd rings through the atmosphere at one of its iconic events, it colorfully invites tourists and locals alike to revel in the spirit of the city. By the intricate design of this immaculate building it’s hard to fathom it only took eight months to complete. The Baku Crystal Hall is much more than a concert venue, although watching you favorite performer put on a show here will be an experience you will never forget. That’s because the dazzling arena is set on a peninsula and dressed with approximately 9,500 LED lights that make it a must-see attraction at night. When the sun fades, the Baku Crystal Hall shines brightly in an array of colors that seem to be sending a signal to the gods of the sky. It is also intricately constructed out of a muted steel that gives it a crystalized façade. The Baku Crystal Hall is a timeless structure that blesses its onlookers with architectural beauty, regardless of what time of day they are in its presence. Believe it or not the Milky Way has officially landed on earth. Well that’s the thought that comes to mind when while capturing an eyeful of the Ericsson Globe, an arena modeled after it. As the largest sphere-shaped building in the world, taking a seat in one of its 14,000 seats will be historic in itself. The Ericsson Globe is an architectonic gem that graces Stockholm with a staggering 48 pillars towering 90 feet tall that effortlessly hold its aluminum panels up. Bedecked with numerous skylights that make the stadium a nightly show as well, you’ll want to grab a front row seat inside or outside this giant atmospheric ball.